We're fairly certain your event attendance desires and button smashing proclivities have been satisfied for the time being thanks to our previous event. With that in mind, this month we're celebrating new lore and information that hasn't been released before! Once per lifetime, every 52 years (in Earth's fall), the Faedin celebrate the Festival of Passage. This is a year-long festival, in which the Faedin observe and recognize their relationship to the animal spirits of the world, the process of reincarnation, and the transition from what was before, to what will come. The Kypiq celebrate this time by hosting The Masque of Passage - A masquerade lasting a full month similar to Mardi Gras where people dress up in costumes to honor the different animals of Elyria. The Pursuit of Passage is a hunt lasting a full month, where Brudvir dress up as wolves and attempt to join the wolf packs, and then proceed to hunt with them. They hunt and kill in order to usher in the end of an animal's life to prepare for Queen's Gaze and the chance for reincarnation. The Janoa honor this time with the Contest of Passage - a month-long tournament where people fight within a circle against other people, or against a selection of animals, to demonstrate their prowess. Others who share a close relationship with a Faedin tribe may join in the celebrations and use them for their own means. Notably, the Neran may use this as a time to join in with the merry-making of the Kypiq, and the Hrothi may use this as a time to foster and encourage relations with the Brudvir, offering to sell them thematic weapons, etc. The To'resk may use the contests of the Janoan as a series of events in which to gamble upon. As this time in Elyria is celebrated, you can be certain there will be stories passed down through the ages about grandiose Masque of Passage costumes, and unfathomable skills demonstrated by young Janoans during their contest. However you celebrate, think of your animal spirit as you do and your life will be richer for it! Keeping with our tradition, this month during the Festival of Passage, new limited-availability items are now in our online store! These promo items will be available starting on September 19th, 2018 and lasting through Friday, September 28th, at 12pm PDT. After that, all promo items will return to the vault. Description: Honor the transition of the soul and the Festival of Passage with traditional Faedin instruments. 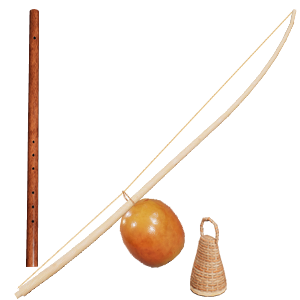 They say that the howl of Ylva''s pack, the first wolves to connect with the Brudvir, can be heard through their flutes, while the berimbau of the Janoan Contest marks the entrance of a new warrior into the fray. Whether you are joining the Pursuit or taking up the Contest, steady your mind and attune yourself to the spirits around you with the Sounds of Passage. Description: Adopt the form and techniques of the wolf and join the pack! 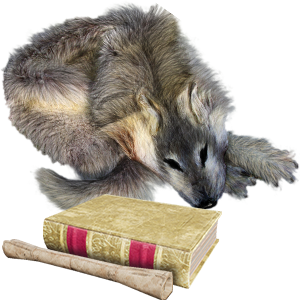 Celebrate the Brudvir connection to the spirit of the wolf and the Pursuit of Passage as you follow in the footsteps of the first Brudvir, donning the wolf costume and stalking your prey. Description: Celebrate the many forms of the spirit with this collection of Kypiq masques! Each mask represents the Faedin's belief that the animal spirits of the world are deeply connected to the Tribes of Elyria. Don your masque and enjoy the many shapes and forms a soul can take in the Cycle. Description: Embark on a mind-expanding spirit journey through the Astral Plane as an animal spirit! Description: Travel in style – Brudvir style – with this sled and your own private wolf pack! 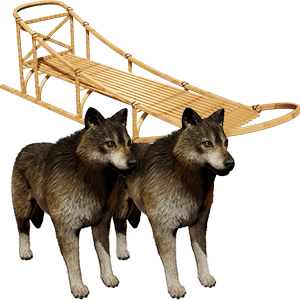 Though meant primarily for the snow, these sleds can be drawn across almost any terrain with the right team and there is no team as determined, loyal, and lethal as your very own pair of domesticated pet wolves! Description: Start a pack of your own with this domesticated wolf! A wolf's pack is its family, when one adopts a wolf, they are adopting a fiercely loyal companion. Family in spirit, if not in fact. That's all for now folks, we hope you enjoy this promotion and the lore story that accompanies it! Make sure you head on over to our online store and grab the items you are most interested in as they return to the vault on Friday, September 28th at 12pm PDT! If you have any questions about this promotion, please reply to this thread or email us at support@soulboundstudios.com. The clothing/dressing as a wolf sounds pretty interesting! A shame I can't play the game yet...Hopefully I will be able to find or make such a unique appearance. Might wanna try a bear or an Elk. Makes me wonder how would that look now lol. Yes, you will be able to use spores to grow more mushrooms. No, sleds will not work well in the Jungle. Wolves won't do so bad, as long as they stay far away from anything poisonous and bigger than them (Fanged Crescent Jaguar). Yes, you will be able to use spores to grow more mushrooms. No, sleds will not work well in the Jungle. Wolves won't do so bad, as long as they stay far away from anything poisonous and bigger than them (Fanged Crescent Jaguar). Can I grow more Psilocybin mushrooms out of the spores in the Hrothi underground boime? Will we be able to grow more magic mushrooms with the spores provided? I just want to know if the sleds two dogs can be breedable... so you can actually get pups and have a full pack of 6..eventually? No answer to this? Wondering the same about the single wolf, can you choose the gender or will it come at random? Posted By **Ballin Stormhammer** at 9:50 PM - Fri Sep 21 2018 > > I just want to know if the sleds two dogs can be breedable... so you can actually get pups and have a full pack of 6..eventually? No answer to this? Wondering the same about the single wolf, can you choose the gender or will it come at random? Yes you can breed them. The post does not state random gender, so you will be able to pick the gender with your token. Posted By **Lestat** at 07:38 AM - Sat Sep 22 2018 > > Posted By **Ballin Stormhammer** at 9:50 PM - Fri Sep 21 2018 > > > > > I just want to know if the sleds two dogs can be breedable... so you can actually get pups and have a full pack of 6..eventually? > > No answer to this? Wondering the same about the single wolf, can you choose the gender or will it come at random? Yes you can breed them. The post does not state random gender, so you will be able to pick the gender with your token. 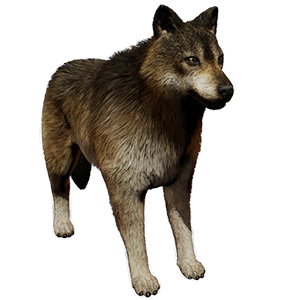 Due to numerous requests from the community, a 6th item was added to this promo: ##Domesticated Wolf **Description:** Start a pack of your own with this domesticated wolf! [! (https://cdn.chroniclesofelyria.com/articles/2018/september/Chronicles-of-Elyria-Festival-of-Passage-Wolf.png)](https://chroniclesofelyria.com/shop/merchandise) A wolf's pack is its family, when one adopts a wolf, they are adopting a fiercely loyal companion. Family in spirit, if not in fact. **Contains:** * Domesticated wolf pet ####Enjoy! Haha yup, I'm going to have to try and buy that Brudvir Wolf Outfit. That looks too awesome. Really loving the lore, I need to pick a day to sit and read it all!! Do the instruments come with the recipes/blueprints to make them? Why a mask is 12.50$ but a pet 6$? Actually, it's 5 masks as well as the recipes to make them in the crafting system for $12.50, or about $1.25 per item in the set. Somehow this Elyrian event (time of "year") is something interesting and those masks are pretty nice. I am missing an Otterbear mask though. This Kipyq approves of this update, just as the Q&A last night. Somehow this Elyrian event (time of "year") is something interesting and those masks are pretty nice. I am missing an Otterbear mask though. This Kipyq approves of this update, just as the Q&A last night. Cool outfits and masks and wolves! Yes wolves! Mushroom tripping in Elyria as a animal sounds incredible. I only have cash spare for one promo item and, while I adore that wolf sledge, I'm going to stick with the masks and mask patterns. 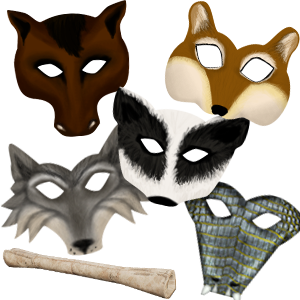 I only have cash spare for one promo item and, while I *adore* that wolf sledge, I'm going to stick with the masks and mask patterns. Worst timing yet on a promotion package. I don't know about other "Gentry" level players but I have committed to a Mayor and have no interest in the dance of dynasties. With the upcoming map selection followed by land selection, my biome will be out of my influence as such why would I want to spend on biome specific items at this point in the timeline unless items like the sled are changeable to a biome equivalent item. Worst timing yet on a promotion package. I don't know about other "Gentry" level players but I have committed to a Mayor and have no interest in the dance of dynasties. With the upcoming map selection followed by land selection, my biome will be out of my influence as such why would I want to spend on biome specific items at this point in the timeline unless items like the sled are changeable to a biome equivalent item. Not sure what influence has to do with buying store items VS map voting, you use store credit or your own funds to buy the items and map voting is dependent on player total-influence, two separate numbers. I don't think he's talking about player influence, he just means he has no influence on where he will begin as a player as it out of his hands being pledged to a higher noble/kingdom already. Exactly the issue, why have biome items before we know what biome we will be in. Posted By **Mandos** at 04:02 AM - Fri Sep 21 2018 > > Posted By **Hellmoon** at 7:01 PM - Thu Sep 20 2018 > > > > > Not sure what influence has to do with buying store items VS map voting, > > I don't think he's talking about player influence, he just means he has no influence on where he will begin as a player as it out of his hands being pledged to a higher noble/kingdom already. > > Same reason that although I love wolves I can't buy this wolf promo because if my kingdom ends up in an arid location it will be wasted. :) Exactly the issue, why have biome items before we know what biome we will be in. Wolf sled Woop woop! Them wolf furs look mighty warm and comfortable, would not mind visiting the brudvirif I could get transported around in a comfy fured sled. @Leilah, I recommend checking your Private Messages. @Leilah, I recommend checking your Private Messages. Thank you! No love for the waerd i see, guess ill go cry in my communal house. May need to replace the wolves with something else or create a breeding program to make them more resistant to hot and dry en arid environments, maybe cross breeding with local dog species if they exist. Posted By **PrinceChawmin** at 9:19 PM - Wed Sep 19 2018 > > No love for the waerd i see, guess ill go cry in my communal house. The first thing I was thinking is “hey, sand sled, why not?” May need to replace the wolves with something else or create a breeding program to make them more resistant to hot and dry en arid environments, maybe cross breeding with local dog species if they exist. That's not a bad idea. Though more generally, if Waerd and Al'tifali (Two-Fold Queen) stuff is your jam, next month's event is probably something worth checking into. You can read a little about it in the Calendar of Events. Will the wolves be good to go in janoan lands or is there a different event that would be better for janoan/tropical animals. Posted By **Snipehunter** at 3:18 PM - Thu Sep 20 2018 > > Posted By **zimmah** at 12:06 PM - Thu Sep 20 2018 > > > > > Posted By **PrinceChawmin** at 9:19 PM - Wed Sep 19 2018 > > > > > > > > No love for the waerd i see, guess ill go cry in my communal house. > > > > The first thing I was thinking is “hey, sand sled, why not?” > > May need to replace the wolves with something else or create a breeding program to make them more resistant to hot and dry en arid environments, maybe cross breeding with local dog species if they exist. > > That's not a bad idea. Though more generally, if Waerd and Al'tifali (Two-Fold Queen) stuff is your jam, next month's event is probably something worth checking into. 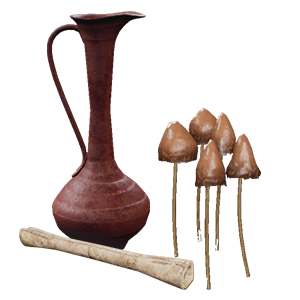 You can read a little about it in the [Calendar of Events](https://chroniclesofelyria.com/forum/topic/28673/official-calendar-of-promotions-events). > > Hope that helps! :) Will the wolves be good to go in janoan lands or is there a different event that would be better for janoan/tropical animals. Waerd are tifa. Their time is yet to come. I couldn't pass up the chance at getting some of these items. Wolf related items are the best. will we be able to breed the pair of wolves or will they be genderless, both male or both female, random gender? i'd defiantly buy at least one pair if we can breed them. I'm wondering if you will actually learn things while stoned out of your mind on magic shrooms. Like get skills from a past life, or insights leading to obtaining the first point of skill so you can continue to learn by observing, in or out of the astral plane. If it's more than just a way to run around in a different form, then I think my wallet is going to have to spill its guts for this promotion. Seriously, what hunter would not like a pair of wolf pets? I'm also curious how feasible the sled will be in rougher terrain, or if it can be modified with two axles and wheels for a mini-cart type thing. I'm wondering if you will actually learn things while stoned out of your mind on magic shrooms. Like get skills from a past life, or insights leading to obtaining the first point of skill so you can continue to learn by observing, in or out of the astral plane. If it's more than just a way to run around in a different form, then I think my wallet is going to have to spill its guts for this promotion. Seriously, what hunter would not like a pair of wolf pets? I'm also curious how feasible the sled will be in rougher terrain, or if it can be modified with two axles and wheels for a mini-cart type thing. How powerful are Wolves compared to the Canis Rabbit's? From artwork I've seen, they look fairly intense and Wolves aren't even part of the bestiary on the wiki. Are the wolves pets only suitable for cold brudvr biomes? Actually, no. :) They're pretty good in most temperate and cool biomes. Would we be able farm more of those "mushrooms"? I'm loving the chance for the wolf related items. I believe this season speaks mostly to the Brudvir. I absolutely love this promo. That's probably an understatement. I mean wolves....wolves!!! Thanks for more items SBS! Something just dawned on me after I purchased Wolf's Clothing, I been purchasing things all the time without really thinking but how are we going to carry all of this stuff? I will be able to store it in my home but for those who are not that fortunate to own a town/home etc how will they carry all the stuff they purchase? I'm thinking we'll have the opportunity to determine when and where to activate it. At least for those with Alpha/Beta access. Or it could be people using wagons, or storing their items in something similar to a bank but for items instead of money. At least with these promotion items you have sometime after launch to claim them, compared to EP items which you need to claim before expo ends. But either way, I expect many people will just fill their house with heaps of crap or really never claim half the things. Posted By **Gozirra** at 08:08 AM - Thu Sep 20 2018 > > Something just dawned on me after I purchased Wolf's Clothing, I been purchasing things all the time without really thinking but how are we going to carry all of this stuff? I will be able to store it in my home but for those who are not that fortunate to own a town/home etc how will they carry all the stuff they purchase? At least with these promotion items you have sometime after launch to claim them, compared to EP items which you need to claim before expo ends. But either way, I expect many people will just fill their house with heaps of crap or really never claim half the things. @Gozirra You have to claim the items. I dunno if there is a limit to how long you can go without claiming your store items, but you essentially won't start out with everything you bought in your backpack. So no fancy "death by inventory overload" when you start the game.